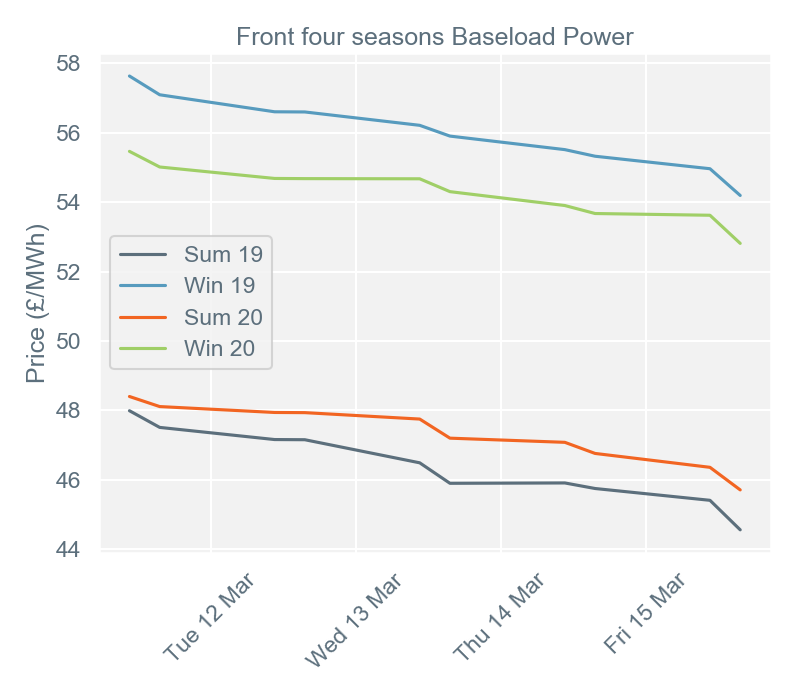 Day-ahead baseload power prices averaged £44.05/MWh during week 11, £2.23/MWh down from week 10. The highest price for day-ahead baseload power was £45.83/MWh on Friday 15th March. 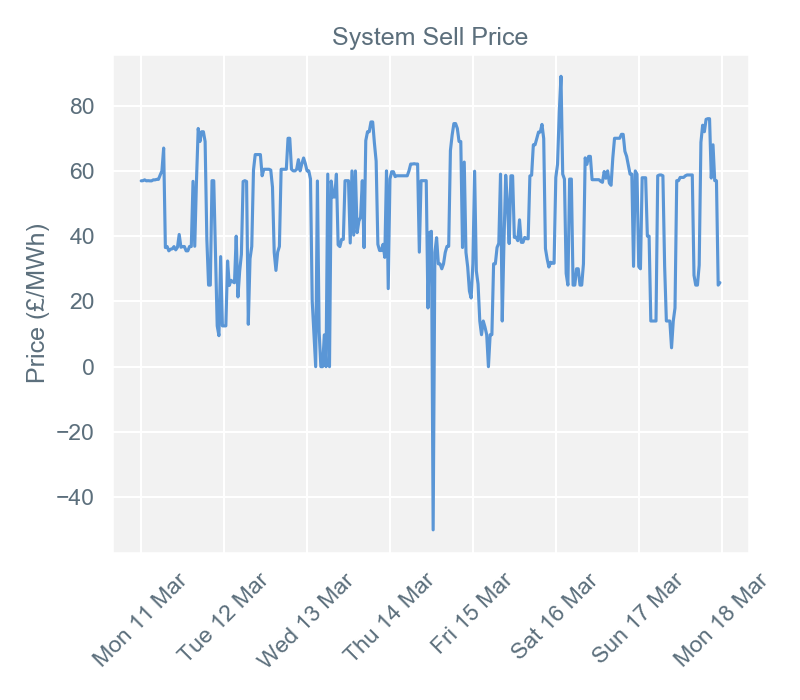 Wind generation was forecast to ease a little over the weekend after being consistently above 10GW since 7pm on Monday 11th March, resulting in a higher demand from the typically more expensive sources of generation. 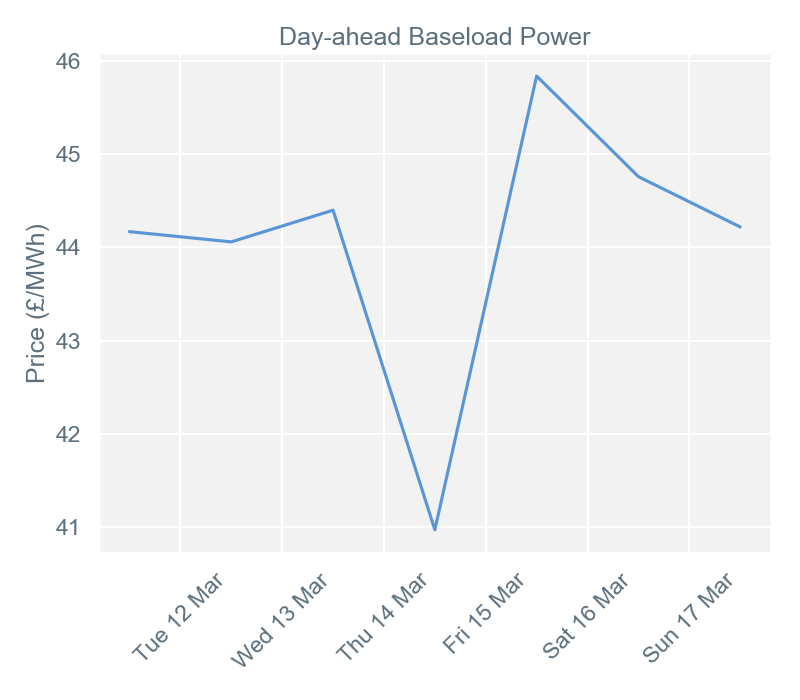 The lowest price for day-ahead baseload power was £41.03/MWh on Thursday 14th March. National Grid’s forecast data showed that wind output would peak at 12.2GW that day, having reached only 10.9GW on the previous day. Expected increases in wind generation reduce the system’s reliance on gas generation, which is already oversupplied. This situation is set to intensify as the weeks ahead show a busy schedule of liquefied natural gas (LNG) vessels arriving in UK ports. Settlement period 4 (01:30 – 02:00) on Saturday 16th March saw the highest imbalance price during week 11. Wind generation had fallen sharply (by about 2GW in an hour) before this period, leaving the system short of power - and National Grid short of options for balancing the system. The systems operator set the final price of £89/MWh by accepting Spalding power station’s offer to increase generation by burning natural gas. 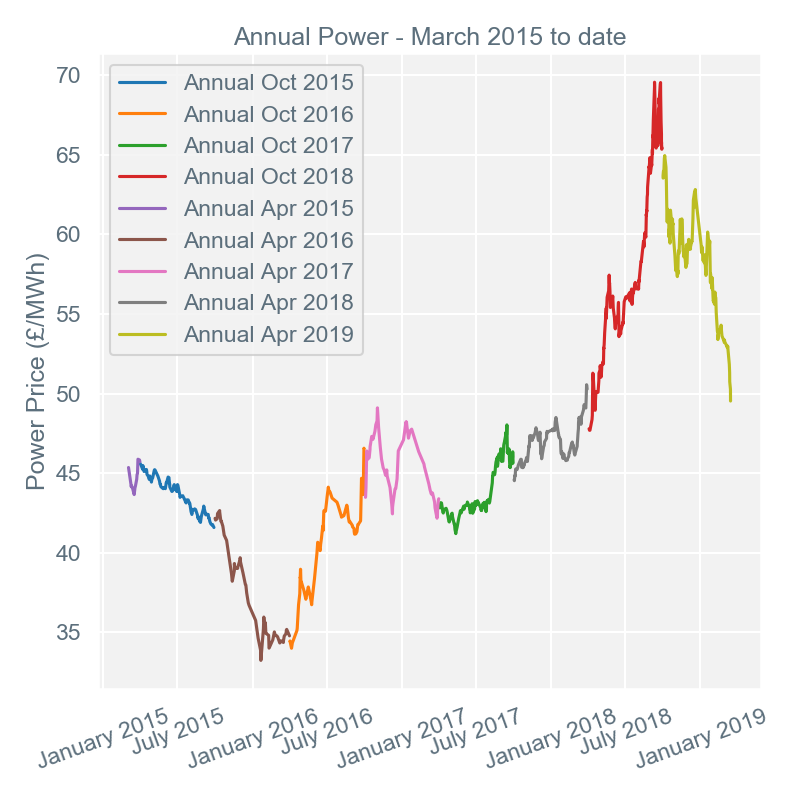 Settlement period 26 (12:30 – 13:00) on Thursday 14th March had the week’s lowest imbalance price: a negative figure of -£50/MWh. This was because of high wind generation during this settlement period coinciding with peak solar output of 5.5GW to create excess generation. National Grid set the final price by accepting 105 bids from various wind farms to reduce generation. Renewable generation in the UK was strong again during week 11, continuing the trend from week 10. 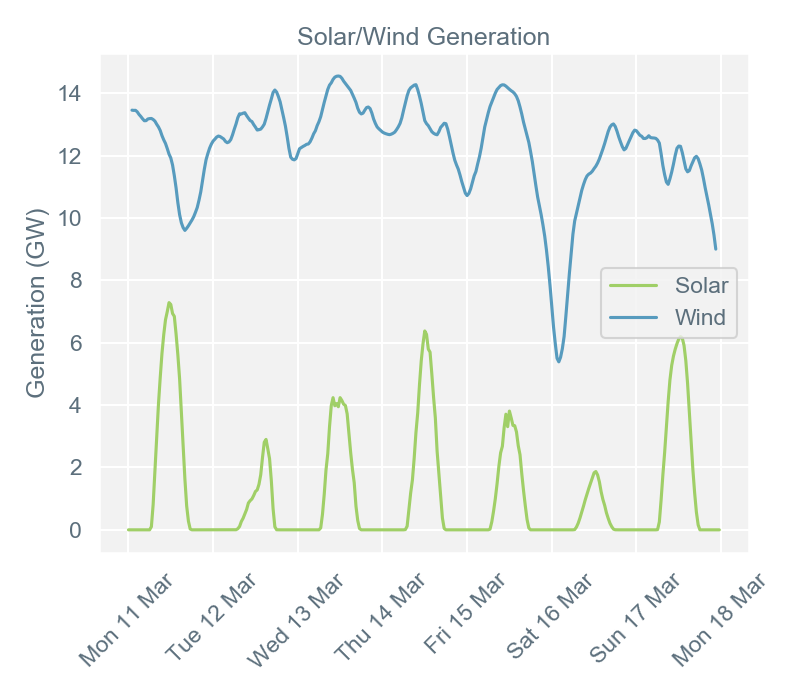 Wind production was more impressive than solar, producing over 9GW all week except during one period between 11pm on Friday, 15th March and 6am on Saturday, 16th March. Wind generation peaked at 14.7GW on Wednesday, 13th March when it was contributing 35.3% of the generation stack. Solar was much less consistent than wind, reaching over 6GW just three times (on Monday, Wednesday and Sunday). It peaked at 6.8GW on Monday 11th March when it was accounting for 16.1% of the generation stack. These two renewables together peaked on Wednesday, 13th March when wind was 14.6GW and solar 4.7GW - a combined 45.8% of the generation stack. Secure and promote* (Seasons +1, +2, +3, +4) baseload contracts lost significant value over the course of week 11, losing on average -£3.05/MWh. On Monday, 11th March, curve prices recorded losses in successive sessions, with weak carbon, coal and gas contributing to the movement. The next two days saw a similar pattern, with commodities across the fuels mix gradually shedding value. On Thursday, 14th March, support from coal and European Emission Allowance (EUA) futures slowed down the downward momentum - although prices were still below Wednesday’s. The Intercontinental Exchange (ICE) Rotterdam coal front-year gained $0.55/tonne throughout the day before closing at $75.30/tonne. On Friday, 15th March, contracts softened under pressure from downward movement on the British National Balancing Point (NBP) gas market. Coal and carbon markets also moved down steadily. The ICE Rotterdam coal front-year was up $0.39/tonne on Friday’s opening compared to Thursday’s close, but was unable to withhold the bearish pressure and lost $2.00/tonne by the close of play. To help you make sense of the industry, you can also use our jargon buster and handy guide to Third Party Costs (currently 60% of your bill). And for interesting articles and useful insights, look out for our blog. Report written by Thomas Stebbings and Ben Symonds, Haven Power’s Portfolio Analysts. To speak to them, or the rest of our Flex & Portfolio Management team’s analysts, call 01473 707755 quoting reference HP250.